White Rock is a city in British Columbia, Canada. It is a member municipality of Metro Vancouver, the governing body of the Greater Vancouver Regional District. 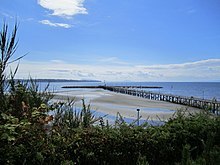 It borders Semiahmoo Bay and is surrounded on three sides by South Surrey. To the southeast across a footbridge lies the Semiahmoo First Nation, which is within the borders of Surrey. Semiahmoo Bay and the Southern Gulf Islands in the Strait of Georgia are also to the south. White Rock has a moderate climate, with average daily high temperatures of 23 degrees Celsius in summer and 6 degrees Celsius in winter. White Rock is named for a distinctive large white boulder on its beach near the promenade, a glacial erratic that migrated south during the last glaciation. The 486-ton granite boulder was kept white by shellfish-eating seabirds whose guano covered the rock, so much so that 19th-century sailors used it as a beacon. However, it is now kept white through monthly applications of white paint by the city parks department, and has been a popular graffiti target for over thirty years. The pier and promenade are popular destinations, but do not allow dogs, bicycles or skateboards. These areas are very busy during the warmer summer months, especially when it comes to line-ups for gelato or fish and chips. The current mayor, Wayne Baldwin, was elected on November 19, 2011.